Few people wear as many hats as Deneen Swartzwelder. The mother of two not only owns her own cleaning business, but also runs the kitchen at GoodFellas Restaurant & Tavern. And on top of all that, she is a third term mayor of Swissvale. Swartzwelder decided she wanted to become mayor at the age of 13. That year her father, a Swissvale councilman, ran for office and lost by 13 votes. “I always had the idea at the back of my mind,” she explains, “but it wasn’t until 2005 that I finally told myself ‘what are you waiting for?’ and jumped in.” When the results came in that November, Swartzwelder won with nearly 78% of the vote, becoming the first woman mayor in the borough’s history. Since taking office, Swartzwelder’s focus has been on improving the borough’s police department, coordinating neighborhood events, and generating economic development. Swartzwelder and the Swissvale Council have “taken a police department that wasn’t well run and didn’t have a great reputation and turned it around. Our police now have the resources and support they need to be effective.” She also sits on multiple planning and development boards, and helps to coordinate community events like the annual Easter egg hunt. But it’s her role as Swissvale’s booster-in-chief that inadvertently led to her role at GoodFellas. Owning a bar had been a lifelong dream for Doak Borst, Swartzwelder’s boyfriend. “Originally he was looking for a space in Murrysville, but I pitched him on Swissvale,” she mentioned. “After all, Swissvale is at the center of the world. Why wouldn’t you want to be here?” Luckily enough, an old dive bar in the borough had just come on the market and they were able to snap it up. 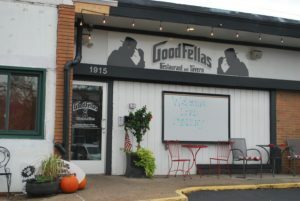 A year and one gut-remodel later GoodFellas was born. Swartzwelder says she and Borst decided to call the bar GoodFellas as a tribute to the 1990 Martin Scorsese film about the mafia. Swissvale, Swartzwelder explains, has multiple connections to the events depicted in the movie. For example, Rocco and Tony Perla, the gamblers Henry Hill worked with to fix Boston College basketball games during the 1978-79 season, were from neighboring North Braddock. Additionally, Rick Kuhn, the BC player at the center of the scandal, was from Swissvale. 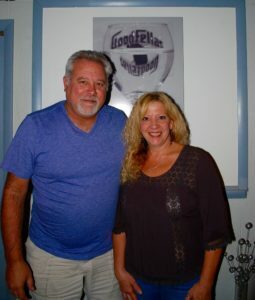 GoodFellas represents an investment in the community Swartzwelder loves. “What I wanted was to open a gathering place. 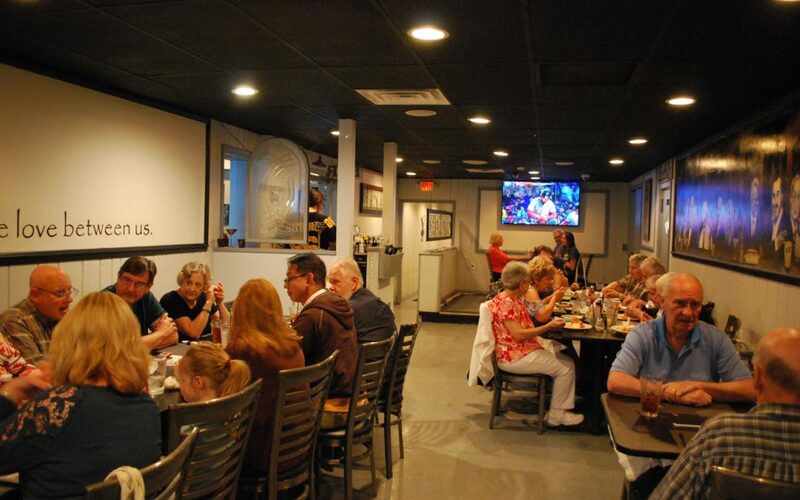 Somewhere you could get together with friends for a drink or bring your family to dinner.” GoodFellas serves up modern pub fare as well as Italian standards like chicken parmesan. 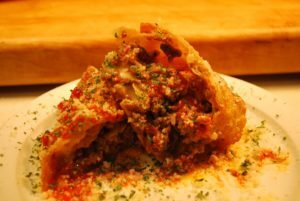 .Look out for the Italian egg roll, a wonton wrapper stuffed with various meats and cheeses and drizzled with marinara. This dish is Swartzwelder’s own creation and it’s not to be missed.